I grew up in north Surrey, where despite urban sprawl there are priceless, remnnant patches of lowland heath. When I was little, these places seemed of little interest; but my understanding of them grew along with society's. A heath is not a wasteland, fit only for dirt-biking and landfill; it is a unique habitat, created thousands of years ago, on sandy soils, by the slash and burn agriculture of our forbears. Over the centuries, plants and animals have adapted to this ecosystem and many now exist nowhere else. Only on our heaths will you hear the electric static song of the Dartford warbler, or the call, like two flints being knocked together, of the stonechat. In summer, you can listen to the weird churring of nightjars - a species of ground-nesting bird that migrates every year to and from sub-Saharan Africa. The list of special creatures continues, rendering these squat treeless places a treasure trove for biodiversity. Sand lizards, natterjack toads, raft spiders, woodlark, hobbies: all depend on the fragmented heaths for their survival in Britain. "This ant, named because of its red dorsal hairs, exhibits unusual and incredible behaviour. 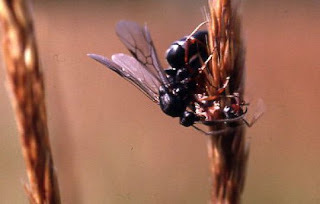 During courtship female winged ants (young queens) will climb to the top of a blade of grass or tall plant stem to attract the attention of males by emitting a scent. The ants also possess an amazing sense of sight and will proceed to their nest entrance in a dead straight line even if obstacles are in their path. Foraging red-barbed ants will also challenge other ant species for food, gripping on and tussling until it can decamp with the prey." Chobham Common, which boasts the only known colony of these ants in mainland Britain, is a gem of a nature reserve. It is probably the most important area of heath in the southeast (especially after Thursley NNR was devastated by arson last year) which, notwithstanding the affront of the M3 ploughing straight through it, offers a rare taste of wilderness in this most populous of counties. I have walked and birdwatched here for years, and seen how much work it takes to maintain an ecosystem under constant threat from fire, development and litter (let alone the rampant growth of Scots pine). Still, the Surrey Wildlife Trust keeps valiantly at the task of stewardship, and it gives me real pleasure to learn that the ant rescue project being undertaken by the Zoological Society of London will seek to establish new colonies in other areas that are intimately familiar to me: Wentworth Nature Reserve, Lightwater Country Park and Sunningdale Golf Course. The funding for the species rescue plan is coming from the Heritage Lottery Fund. It may seem a strange investment. Compared to the plight of the Giant Panda, or the Bengal Tiger, a species of ant is hardly likely to set the public imagination on fire. And yet it is a tiny marvel of evolution: a unique and irreplaceable piece of the jigsaw of life. I, for one, will be delighted if the project succeeds and I have a chance - no matter how remote - of seeing a young queen climb to the tip of a blade of grass and lure a male with her siren scent.